People across the world are trying to look slim, toned, and gorgeous and every one is making looking and keeping fit their motto!! The frog jump is a great exercise to get the heart rate up and burn calories! 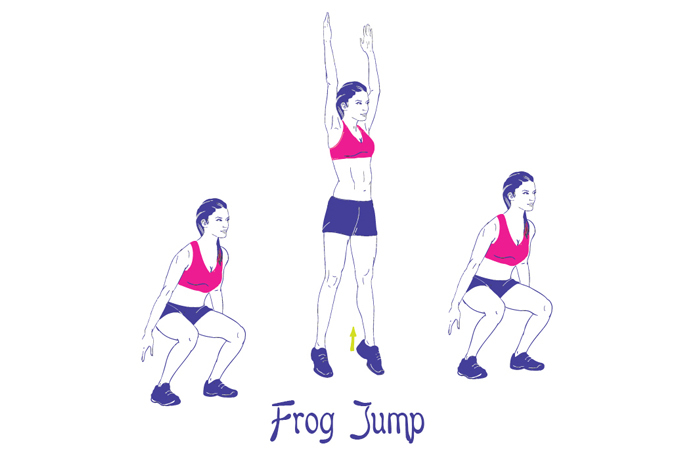 Frog jumps help you strengthen your power muscles, the glutes, so you can power up hills and jump higher, and just like the name suggests, frog jumps are all about jumping like a happy frog! It is an effective movement and is easy to do. It is also important to know how long you should do frog jumps? The point is to lose the fat and not strain your body or injure yourself. Repeat this action 5-10 times if you are a beginner and as you proceed, increase the number of squats. When you are down, remember to breathe in. Breathe out while jumping up. Try not to land on your heels since they aren’t good for your heels. Don’t relax your quads too much. They won’t be of much help either. Strengthens your calves, glutes, hamstrings, quads and leg muscles. If you are looking for some toning, this exercise is perfect for you. Reduces stiffness and leg pain. Helps in melting away unnecessary and stubborn fat from different sections of your body. Boosts memory level and helps to remember things for a longer period of time. It’s cheap and free! You don’t need to join a fancy gym. You can practice frog jumps at home also.